This Montana ski resort delivers big time skiing & entertainment with small town charm. The better question is why not go? Big Sky Resort has a big list of advantages. It’s the largest contiguous ski resort in the USA with 5,800 skiable acres of some of the most diverse terrain in North America. The peak elevation is 11,166 feet with a vertical drop of 4,300 feet. It boasts highly-rated, cross-country and snowmobile trails. Throw in incredible scenery and wildlife, fabulous dining, and undeniable Montana charm, and you should be packing your bags right now! Oh, did I mention that your family gets all of that with no lift lines, reasonably-priced lodging, and an easy-to-navigate base area? Need more? (You’re so greedy!) Big Sky sits about 50 miles north of Yellowstone National Park where incredible winter adventures await. Most lodging options can be found right at the Mountain Village base area or within a very short drive. And you’ll find accommodations to fit almost any budget. Kidtripster Tip: Most on-site Big Sky lodging comes with free lift tickets for kids (ages 10 and under) and discounted tickets for juniors and adults if you book a Ski & Stay package. So even if you find cheaper off-mountain accommodations, this benefit is likely to make up for the difference. Plus, you’ll enjoy the tremendous convenience of Big Sky Resort properties. Kidtripster Tip: All lodging utilizes dynamic pricing, meaning that the price fluctuates based on demand. If you aren’t tied to school vacations or your kids have an unusual couple days off, you’ll find better pricing on lodging and lift tickets. We met friends at Big Sky which gave us a group of 9 (4 adults and 5 kids). We decided to shared a four-bedroom cabin at Powder Ridge, located about a quarter mile from the Mountain Village base area and adjacent to the White Otter lift with access to the main base area. This cabin had it all: master bedrooms on the first and second floors plus two more bedrooms on the main floor, a stunning living room with fireplace, downstairs recreation room for the kids, and private outdoor hot tub. A fully-equipped kitchen allowed for no-fuss breakfasts and mid-day stops for lunch. Whether relaxing in the outdoor hot tub after a long day of skiing or enjoying an evening glass of wine by the fire, we couldn’t have enjoyed this ski-in/ski-out experience more. The Powder Ridge Cabins offer 3- to 5-bedroom options and range in price from approximately $800 to $1,300/night. In addition, you have access to the Huntley Lodge pool and fitness center. The Summit is located at the Mountain Village base area with walking access (about 100 yards) to the Ramcharger and Swift Current high-speed quad lifts. The Summit exudes a Euro-Western elegance and features an outdoor heated pool that faces the mountain, outdoor hot tub, fitness center, and two restaurants: The Peaks Restaurant and the Carabiner Restaurant. If you want stress-free luxury, the Summit provides any and everything you could want - for a price. Rates start at $215/night but can go as high at $1,700/night for the 3-bedroom suite. President Obama stayed here on his visit to Big Sky. Also located at Big Sky’s Mountain Village, Huntley Lodge offers hotel-style rooms, fitness center, heated outdoor pool, outdoor hot tubs, and access to all the amenities at the Mountain Village base. Plus, Huntley Lodge accepts dogs for an additional $25/night; your buddy will be greeted with a bag of dog treats and his own bed. If you plan on skiing all day, know that Huntley Lodge requests that you don’t leave your dog unattended in the room. Private dog day care facilities are available near Big Sky; however, I talked to a few concierges at Big Sky and they said that almost everyone loves dogs and would be happy to let your dog out while you’re on the slopes, so check in advance. Rates at Huntley Lodge start at $189/night. Snoshone Condominium Hotel offers condo living and a full kitchen with the convenience of a Mountain Village location. These condos comfortably sleep up to eight people and offer fitness and pool access. Rates start at $330/night. For a truly unique lodging experience, look to Lone Mountain Ranch Cabins, approximately four miles from the Mountain Village base area. These individual cabins sleep anywhere from 2 to 14 people. Although we didn’t stay in the cabins, we did have a drink at the on-site saloon and dinner at North Fork Ranch. Various packages can be assembled whether you’re a downhill skier, nordic skier, hiker or just want to relax. The nordic package includes three meals provided by the Horn and Cantle. Rates vary based on package. In addition to the lodging options noted above, Big Sky offers a wide array of additional condo and hotel accommodations within a shuttle ride or short drive of the Mountain Village base area. Or you can find other off-mountain accommodations in Gallatin. We had friends who stayed at the Rainbow Ranch Lodge, approximately 10 minutes from Mountain Village and described the place as very cozy, clean, and spacious. They also said the on-site dinner was excellent. Rates are about $230/night. Big Sky is made up of four mountains: Lone Mountain (elevation 11,166 feet), Andesite Mountain (elevation 8,800 feet), Spirit Mountain (elevation 8,028 feet), and Flatiron Mountain (elevation 8,092 feet). Big Sky gets its props from the Lone Mountain Peak and the steep terrain off the Tram, but 38% of the resort is made up of beginner and family-friendly runs. I’m an advanced skier, but some of the most fun that I had was on green and blue runs with my kids. All areas can be accessed via the Ramcharger and Swift Current high-speed quad lifts in the base area. One beauty of the base area is that the lift tickets, rentals, daycare, and ski school are all in a single location at the Snowcrest Lodge. We’ve gotten through the dog days of dealing with daycare and lessons, but I remember the schlepping; the convenience at Big Sky can’t be beat. Speaking of daycare, lessons, and kids’ clubs, Big Sky offers it all - everything from group and private lessons to daycare at the Lone Peak Playhouse to a hybrid of daycare and ski lessons. The kids’ club even allows parents to drop off the kids for a couple hours (4 to 6 p.m.) and enjoy of bit of après ski action. The club is free for guests of Big Sky properties; otherwise, the cost is $15/child. Reserve in advance as the club is limited to 16 kids. If you’re driving to Big Sky with skis and boots in tow, you may want to check out the Madison base area, where you can park within steps of the lodge and access the Derringer and Six-Shooter High Speed Six-Place lifts. (The Mountain Village parking area may require a quick shuttle to the Main Lodge.) The Madison base area gives you access to a nice selection of green and blue trails but also some black diamond terrain off the Lone Tree Quad. We really loved this area of Big Sky. Although most areas aren’t crowded, you’ll feel like you’re at your own private, ski resort on this side of the resort. Grizzly Meadow and Horseshoe were favorite trails with my family. Alternatively, Andesite Mountain offers fun, family-friendly runs, too. Fremont’s Forest is a thinly-covered glade trail that is a blast, even for beginners. It perfectly blends the fun of tree skiing with the ability to get in and out of the trees easily. KidTripster Tip: Take the Southern Comfort Quad to the top and get your camera ready. The view of Lone Mountain is breathtaking from this vantage point and makes for an incredible, holiday card-worthy shot. If you have the need for adventure, take the Powder Seeker High Speed Six-Place to the Lone Peak Tram or Powder Seeker bowl. While I wouldn’t recommend this area for beginners, there are a couple blue square options off the Powder Seeker. My 8-year-old son, who’s a decent skier, was able to handle some of the terrain in the bowl. Otherwise, take the Turkey Traverse across the Bowl and drop in wherever you want to attack the powder. The Lone Peak Tram accesses the peak of Lone Mountain and is the site of many ski films. In fact, a movie was being filmed while we were there. Most of the terrain is double black diamond; however, the Liberty Bowl off the back side is a single black that most advanced (but not crazy) skiers opt for from the Peak. My 11- and 13-year-old sons, both very good East Coast skiers, were able to handle Liberty Bowl, although they were extremely tired once they made it down. 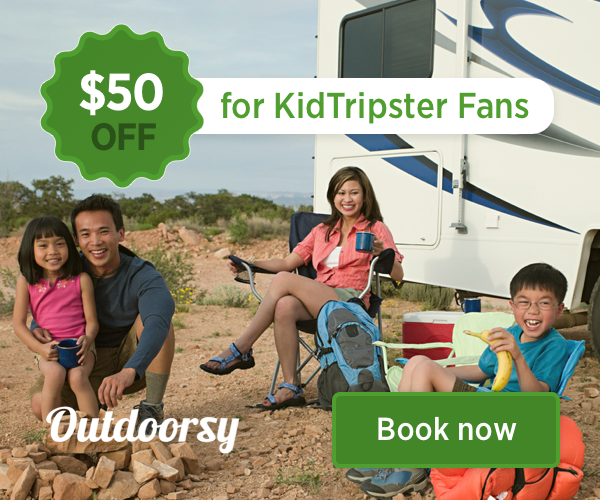 KidTripster Tip: Want to experience the 360-degree views of three states, two national parks, and even the Grand Tetons on a clear day - but want to live to tell about it? Skiers can always take the Tram up to Lone Peak and then take it back down. This lift is the only one with a wait, anywhere between 15 to 35 minutes. We found lunchtime to be the best time to ride the Lone Peak Tram, but it fluctuates based on the visibility. Skiing the flanks (sides of the mountain) and the South Face will give you heli-skiing-like isolation and incredible terrain. The Shedhorn double and Dakota triple lifts provide access to the lower half of the South Face. Before you head to this side of the mountain, be aware that the lifts don’t have safety bars which may be tough for the little ones. However, know that major renovations are in the works to provide more access to the South Face. If you’re not a skier or need a break after a couple days of skiing, Big Sky has plenty of options for you and your family. Yellowstone National Park is the cherry on top of an incredible ski vacation. Big Sky sits about 45 miles from West Yellowstone, the west entrance to Yellowstone National Park. It has been a family bucket-list trip since my wife and I started our family 13 years ago. The wonder and amazement of Yellowstone can be viewed in the tranquility of winter on a snowmobile tour or snow coach (think half bus-half snowmobile). We chose the snowmobile route. Our snowmobile guide, Arrah, told us that it’s her favorite time to see Yellowstone due to the isolation with which you can observe the park’s incredible geological features (including Old Faithful, Fountain Paint Pots, hot springs, and thermal pools) and wildlife. We toured within 15 feet of 20 to 30 ranging bison! During the winter, Yellowstone allows no more than 110 groups in the park (typically of 10 people); compare that to the summer when upwards of 20,000 cars and buses can enter the park on any July weekend. There are a number of outfits that offer these winter trips; we went with Yellowstone Vacations and found them to be friendly and knowledgeable. My family of five had this once-in-a-lifetime experience for about $600, including sled rental, clothing rental, insurance, taxes, and park fees. KidTripster Tip: Book early and do reserve the snowmobile clothing. You’ll need it to keep warm while touring Yellowstone at 35 mph. The weather can change drastically within minutes, so don’t let sun in West Yellowstone dictate your clothing choices. If you’re at Big Sky for a week, a Wednesday or Thursday trip is a nice rest for wary ski legs. North America’s top-rated cross-country ski trails are located in Big Sky Country. Lone Mountain Ranch offers 52 miles of groomed nordic trails, just four miles from Mountain Village. Cost: Youth (ages 12 and under) Free; Youth (13-17) $15; Adult $20; rentals are available for about $20/day. Pick up snowshoe gear and a guide right at the Mountain Village base area and take a 2-hour trip through Moose Tracks Gully. My friend did a snowshoe adventure and loved her day. Cost of 2-hour tour including rental: $52. Big Sky offers two zipline tours: the Adventure Tour and the Nature Tour. The Adventure Tour is little bigger and requires a trip up the Explorer Chair before starting the ziplines. The lines are upwards of 1,500 feet and 150 feet in the air. It even offers a twin zip where you can race your traveling partners. Minimum weight is 90 pounds. The Nature Tour is a gentler version and is more friendly to younger zippers who weigh at least 45 pounds. It starts with a 15-minute hike up the mountain and zips through the Moose Tracks Woods. Zips are up to 490 feet in length and 50 feet in height. We chose the Nature Tour since our youngest didn’t meet the minimum weight requirement for the Adventure Zip. It was a blast, and our guides were so friendly and knowledgeable about Big Sky. My older kids made it clear that they want a shot at the Adventure Tour next time around. Cost: Nature Tour $42; Adventure Tour $62. Dog sledding tours are offered about a mile from the Mountain Village at the Moonlight Basin through Spirit of the North. Cost: Youth (5 and under) Free; Youth (7-12) $85; Adult $135. If you want to venture toward Yellowstone, tours through the Gallatin National Forest also are available. Big Sky has a number of options for all palates and budgets. If you’re looking for a more sophisticated option, try lunch or dinner at Everett’s 8800 at the top of the Ramcharger lift. Reservations are recommended; a lift ticket is required for lunch access. Down at the Mountain Village, we enjoyed a wonderful lunch buffet at Peaks (which changes buffet themes daily) for about $20/person. No, it’s not cheap, but we’ve spent about $20/person at some lodges in other areas of the country on chicken fingers and fries. Here, we had a wonderful assortment of greens, chicken parmigiana, prime rib, dessert, and more. If you’re looking for some après ski dining and live music, check out Chet’s Bar and Grill at Huntley Lodge or Montana Jack at Mountain Village’s Mountain Mall. And Scissorbills Saloon, located at Mountain Village, was another favorite après ski choice. Cozy, lively, and reasonably-priced with great specialty drinks and nachos piled high, it seemed to be a favorite with locals, as well. Since we stayed in the Powder Ridge Cabins, we made breakfast each morning which saved money. I did venture to the Mountain Mall one morning, however, and grabbed a sausage, spinach, egg, and cheese wrap from The Hungry Moose Market and Deli which was delicious! KidTripster Tip: The Hungry Moose Market and Deli has a wide selection of groceries, wine, and beer. If your lodging has a full kitchen, The Hungry Moose has almost anything that you’d ever want at reasonable prices. Black Kettle Burrito Co. off the Swift Current Quad and overlooking Powder Seeker is a must with its quick, friendly service and killer burrito for $12, plus an incredible view to boot. If you’re enjoying the flanks on the South Face, check out the Shedhorn Grill to get a taste of the Killer B’s (beers, brats, and burgers) or enjoy the locally-made soups; the beef tenderloin soup is incredible! Housed in a yurt, it has an indoor fireplace and outdoor patio. For a truly Montana experience, head to the Horn and Cantle located at the Lone Mountain Ranch. The dining area is Old West-themed with several mounted elk, bison, and bobcats overlooking patrons. The Horn and Cantle gets exceptional reviews from those we spoke to and specializes in steak and prime rib. While we didn’t eat there, we did choose a sleigh ride dinner from the Lone Mountain Ranch which starts the journey at the saloon. From there, we boarded our horse-drawn sleigh for a 20-minute ride up the trail to the North Fork Cabin, a lantern-lit, wood stove-heated cabin that made you feel like you had ventured back in time. Live country music and tales of the Old West from Cowboy Rick compliment the feast. Most of us dined on prime rib, mashed potatoes, veggies, and a flavorful potato-leek soup. However, we did have two vegetarians in our party; one ordered the cauliflower steak and the other the salmon. Both received very good ratings. The ambience and experience of the North Fork Cabin was a truly, unique experience for my family. It does, however, come with a price. Cost: $135/person plus alcohol which can be purchased at check-in. KidTripster Tip: Purchase your wine and beer at The Hungry Moose or Roxy’s Market to save a few dollars. Also, if you plan on bringing the kids, a nap prior to dinner is advised. Dinner is from 7 to 9 p.m. in a dim and warm room. If the kids have skied all day, the atmosphere may make them sleepy. If you want to venture from Mountain Village, there are two additional villages about 6 miles off the access road. We tried the Lone Peak Brewery, a true microbrewery, and loved our meal which included fantastic salads, great burgers, and delicious soups like the beer cheese soup topped with popcorn. If you’re looking to try some Montana-style BBQ, head to The Green River Grill in Gallatin. It’s a very lively and sometimes crowded place. If you need to wait, there’s a selection of video games and billiards for the kids. To reach Big Sky, you'll need to fly into Bozeman. Direct flights come in from Atlanta, Chicago, Dallas, Houston, Las Vegas, Los Angeles, New York, Phoenix, Portland, Minneapolis, Salt Lake City, San Francisco, Seattle, and Los Angeles; otherwise you’re connecting to one of the above. Big Sky is about a one-hour drive through the Gallatin River Canyon on U.S. Highway 191. KidTripster Tip: Certain Big Sky properties offer free shuttle pick-up and drop-off to Bozeman Airport. If you’re the type of family that doesn’t want to deal with a car, it’s a great option. If you choose the carless option, know that there are enough dining, shopping, and activities between the Mountain Village, Meadow Village, Town Center, and West Fork Meadows to keep you busy. Due to some unusual travel dates, we went with option 2: a direct flight to Salt Lake City and then a drive north to Big Sky. The drive time was about 5-1/2-hours, but the total travel time was not significantly different than a layover plus flight; plus, the drive was impressive. With five passengers, we saved a decent amount of money by going this route. Bill Claffey lives in Colchester, Connecticut, and loves taking his family on spontaneous outdoor adventures. He’s the proud father of three boys, who all race for the Catamount Ski Team in Hillsdale, New York. This writer received a complimentary stay and some activities for the purpose of this review. However, all opinions expressed are solely his own.